There are 16 people running for eight councillor positions in Yellowknife. They were all invited to a debate on Wednesday evening, ahead of the Oct. 15 election. 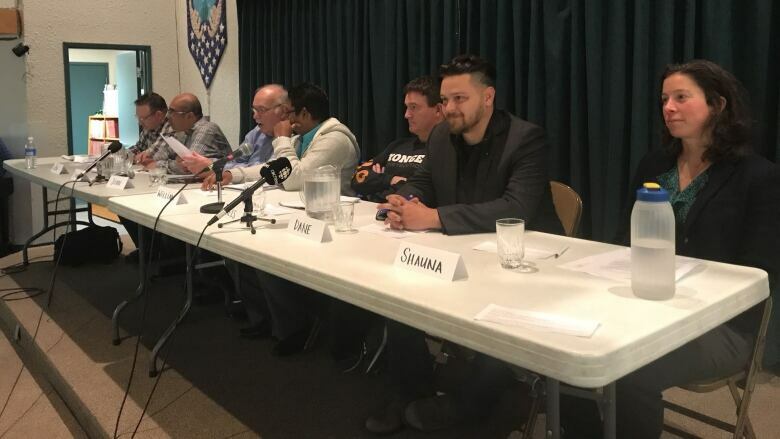 Candidates for Yellowknife city council faced off in a debate Wednesday evening at Northern United Place. Alternatives North, a social justice coalition, hosted the forum ahead of the Oct. 15 election. Fifteen of the 16 candidates were in attendance. The candidates, who are vying for eight seats on council, were divided into two groups. Each group had one hour to debate two resolutions concerning social and environmental issues in the city, such as whether to clean up downtown. At the end of each debate, the group debating the issue voted on the resolution in question. Alternatives North said this is meant to simulate a real council meeting. CBC North's Gabriela Panza-Beltrandi live-tweeted from the debate. You can read her posts below.